Which Is the Best Baby Eco Friendly Outdoor Swing? Green-minded parents can now find a variety of baby swings that meet several eco friendly criteria, including non-motorized units made from natural, recyclable and/or secondhand fabrics. These reviews of some of the best baby eco friendly outdoor swings currently available focus particularly on what makes these baby swings eco friendly and attention to child safety. Swinga Baby was designed in 2006 by a father who was dissatisfied with the current selection of baby swings, in particular that they had loud motors, took up a great deal of space, cost a lot of money and drained batteries rapidly, not to mention that his son didn't find any of them comfortable. The Swinga Baby was his solution to those problems, inspired by all that he found effective about his son's car carrier, not least of which was how comfortable his boy seemed inside it. That is what is so brilliant about the Swinga Baby design — that it utilizes your baby's existing car seat, enabling you to convert it easily to a baby swing and then, when you're ready, back to a car seat again. Swinga Baby is an ingeniously simple hanger you attach to your infant's existing car seat, no modification to the car seat required, and hook around any secure structure. By using your baby's familiar car seat you benefit from the strong emotional attachment that he or she already has to the seat, saving you from the challenge of introducing your baby to a whole new environment. The Swinga Baby unit is compact and portable, able to fit in a diaper bag or purse and take with you wherever you go. What Makes It Eco Friendly? Swinga Baby uses no batteries and a bare minimum of materials, all recycled; the main part of the swing — the seat itself — being an item you already possess. By creating a way for your baby's car seat to double as a baby swing, the Swinga Baby reduces on the consumer waste that comes from having to buy a separate car seat and baby swing. 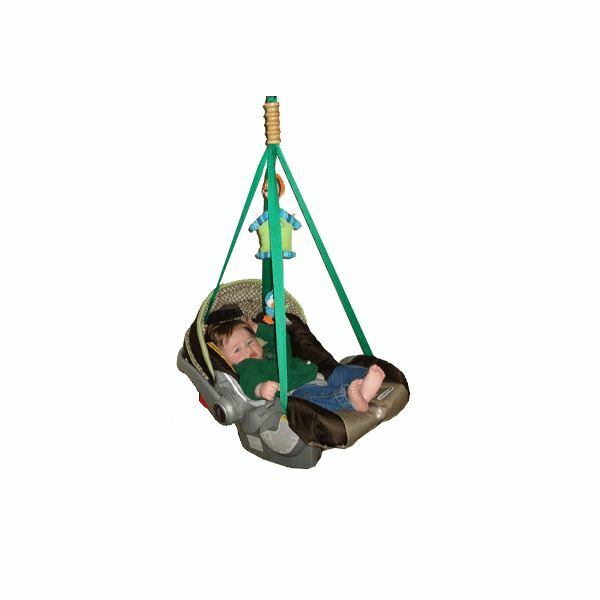 Swinga Baby offers freedom from many of the common safety concerns parents have with most baby swings, including unstable frames, loose screws, incorrectly attached seats and sharp edges on the frames and seats. It's a perfectly balanced unit, stable and secure from tipping over. Robyna makes handmade baby hammocks that you can use outdoors, or inside as a crib or cradle for your baby. When baby grows up you can continue to use it as a sturdy (and by then, sentimental) swing seat for the toddler he or she becomes. Children and teens won't even outgrow it as it transitions from being a cozy baby swing to a comfortable and treasured hammock. Adjust the ropes differently, depending on the desired purpose and where you want to hang it. It comes with a carry bag, instructions and extra ropes. All Zaza's are shipped out of Israel and are machine-washable. What makes Robyna's Zaza baby hammocks eco-friendly is that they are all made from "upcycled fabric" — that is, material that has been recycled into something of even higher quality, in this case: industry surplus cotton fabrics. Because each and every Zaza baby hammock is handmade rather than mass produced with machinery in some factory, each one carries with it only the teensiest carbon footprint. Also, because each one is suitable for kids of all ages as they grow from infant to adult, it has an enduring lifespan with more years of usage than most baby swings will ever provide. All Robyna's Zaza baby eco friendly outdoor swings and kids' hammocks are made using heavy duty professional grade rope and karabiners. According to Robyna, they are even able to support an adult's weight. Talk about eco-friendly — here is a baby swing inspired by the very workings of nature, particularly that of a leaf floating on the breeze. Made by a Dutch company called Nuna, the LEAF Natural Gentle Baby Swing Chair is, as the name implies, both a swing and a chair. In its resting state, it's a chair positioned at a convenient 27 degree angle that's ideal for baby to sleep or interact with you. As a swing, it rests on a single pivot point which allows the seat to rock while the upper body sways side to side, creating a natural, soothing floating sensation. The LEAF's swing action is activated with a simple tap that sets it in motion for 2 minutes, at which point you simply tap it again to start it swinging for another 2 minutes. 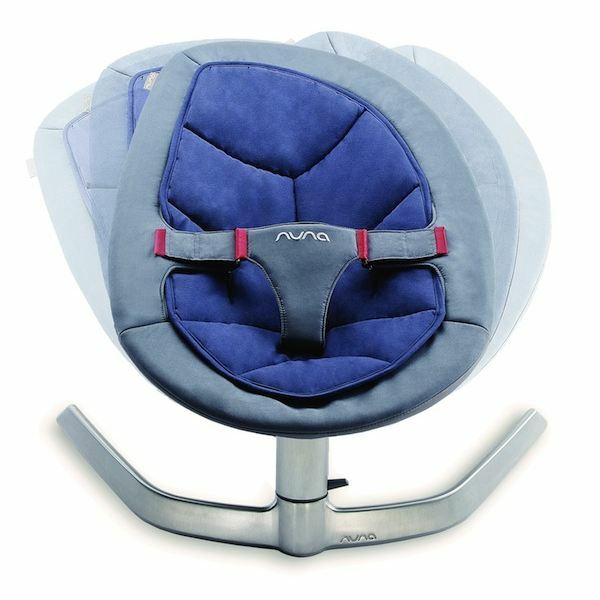 The pads and inserts for the Nuna LEAF baby swing chair are all machine-washable. 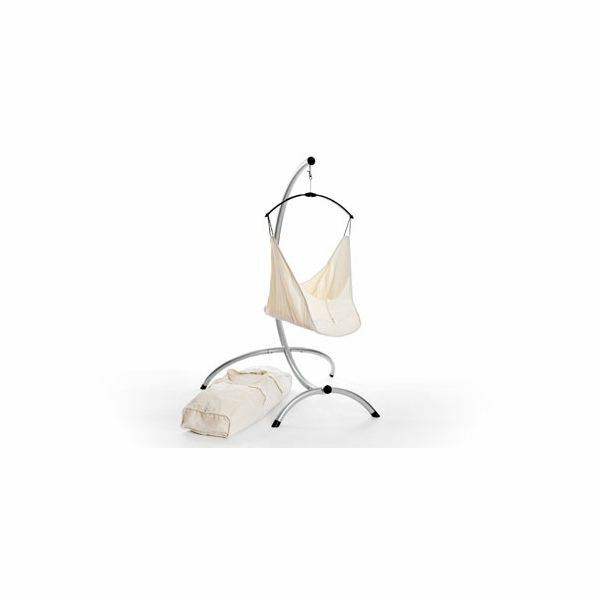 The Nuna LEAF Natural Gentle Baby Swing Chair operates without the use of a motor and the removable, washable insert is made from 100% organic cotton. The Nuna LEAF baby swing chair has passed a series of safety tests, including static load tests (it can hold 113 kg), frame strength tests (it can withstand a 15 kg impact, one-thousand times) and vibration tests (it maintained smooth operation after even 1 million cycles). It also has a motion lock, should you want to keep it from swinging, and a rock-safe base. The Hushamok Dream is a multipurpose set centered around the eco friendly Hushamok Hammock for babies. The Hushamok Dream lets you make the most of the Hushamok baby hammock by including a lightweight aluminum stand that lets you use it as free-standing baby swing, rather than hanging it from a support bar. It also includes a mattress and sheet set that lets you use the Hushamok on the floor as a comfy bed. The Hushamok Hammock can also be purchased by itself, without the stand, sheet set, mattress and travel bag. The hammock and all other fabric components of the Hushamok are machine washable. All of Hushamok's products are eco friendly. The hammock, sheet sets and travel bag are all made from 100% organic cotton. All elements of the Hushamok Dream were designed by certified industrial designers and meet US Juvenile Products Manufacturers Association (JPMA) Certification Program safety standards, as well as the standards of several leading industry safety certification authorities in America and the EU. 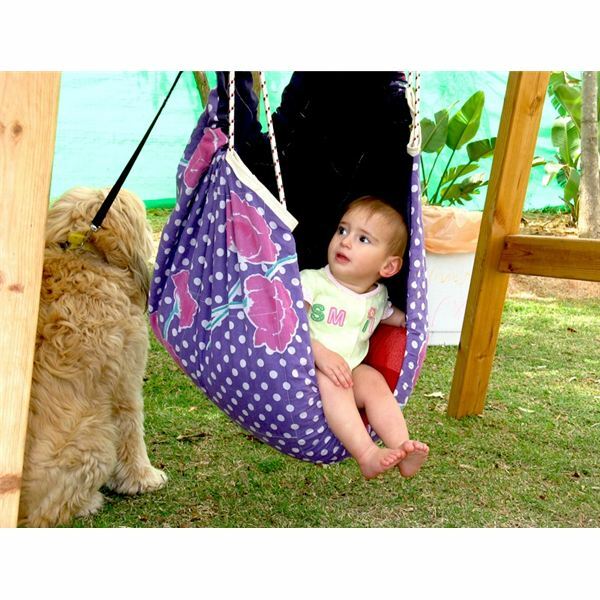 The Hushamok hammock is made with an open design to promote free airflow and allow you easy access to your baby. Using a unique, proprietary leafspring design rather than a coil spring, there's none of the dangerous jumping and jerking associated with some baby swings that, among other problems, could cause babies to shift in their seats. An EVA foam insert maintains the baby's healthiest breathing position, supporting his or her spine and preventing spinal compression that could restrict breathing. Hushamok designs all its products, including the Hushamok Dream and Hushamok Hammock, to support babies in sleeping safely on their backs, protecting their spines and warding against many of the health concerns associated with baby's sleep, including Sudden Infant Death Syndrome (SIDS), Flat Head Syndrome (Plagiocephaly), Infant Acid Reflux and restless sleep. The Hushamok baby hammock will not function if hung improperly, preventing it from operating dangerously imbalanced. It has no adjustable parts, preventing the risk of the baby being set an at incorrect angle and accidentally rolling off. The Hushamok baby hammock is designed for newborns up to age 6 months or 22 pounds and should not be used after the baby starts sitting up. There are so many baby eco friendly outdoor swing options available to green parents. Non-toxic, safe, and good for the environment, there is no reason not to look beyond the conventional. Images: All images sourced directly from the respective product manufacturers.